In the middle of the Caribbean, a mysterious island holds countless treasures. One stands out - the Golden Pineapple, the dream of every treasure hunter. You have discovered this fabulous island! But your quest will be dangerous. Fearsome penguin warriors have lived here for centuries, protecting their treasures. Dodge their attacks, and avoid the traps, and face the terrible guardians of the Gold Pineapple! Then steal everything in your path and get back to the boat, safe and sound! 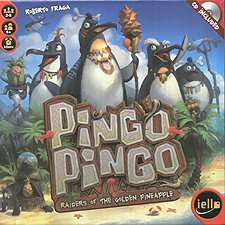 Pingo Pingo is a game of adventure, mixing observation, speed, and dexterity. Listen carefully to the music, aim true with your pistol, and hone your reflexes to win the game!